Do recent moves in the construction industry towards collaborative working and other new procurement procedures really make good business sense? Procurement in the Construction Industry is the result of research into this question and it includes the first rigorous categorizing of the differences between procurement methods currently in use. In the process of carrying out this research, the team has produced a comprehensive study of procurement methods which looks in detail at the relative benefits and costs of different ways of working, with sometimes surprising results. 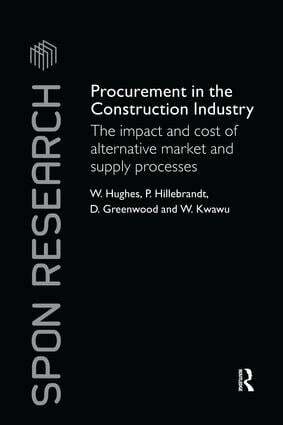 As such, it is not only a valuable guide for practitioners on the complexities of the procurement process, but also an outline of the relevance of economic theory to the construction sector. Will Hughes is Head of School of Construction Management and Engineering at the University of Reading, UK and Editor of the international journal Construction Management and Economics. Patricia M. Hillebrandt is an Economic Consultant specializing in the construction industry and a Senior Visiting Research Fellow at the University of Reading, UK. David Greenwood is Associate Dean in the School of the Built Environment at the University of Northumbria, UK. Wisdom Kwawu is a Researcher at the School of Construction Management and Engineering, University of Reading, UK.